Kate & Leopold is a 2001 romantic-comedy fantasy film that tells a story of a duke who travels through time from New York in 1876 to the present and falls in love with a woman in modern New York. The film is directed by James Mangold and stars Meg Ryan, Hugh Jackman and Liev Schreiber. On 28 April 1876, Leopold, His Grace the 3rd Duke of Albany, is a stifled dreamer. He has created a design for a primitive elevator, and has built a small model of this device. His strict Uncle Millard has no patience for what he characterises as a sign of Leopold's disrespect for the Monarchy, chastising him, and telling him he must marry a rich American, as the Mountbatten family finances are depleted. In response to his uncle's accusations of his blemishing the family name, Leopold counters that the new nobility is to be found in those who pursue initiatives, hence his interest in the sciences and inventions. One day, the Duke finds Stuart Besser, an amateur physicist (and great-great-grandson of Leopold) in his study perusing his schematic diagrams and taking photographs of them. He had seen him earlier at Roebling's speech about the Brooklyn Bridge, after he was laughing at the word "erection." Leopold follows Stuart and tries to save him from falling off the unfinished bridge, only to fall with him into a temporal portal between centuries that Stuart has used to travel to 1876. Leopold awakens in 21st century New York City. He is at first confused and thinks that he has been kidnapped. Stuart says that he has created formulae to forecast portals in the temporal universe and that Leopold must stay inside his apartment until the portal opens again a week later. As Stuart takes his dog out, he is injured by falling into the elevator shaft, and is eventually institutionalized for speaking about his scientific discovery. According to Stuart's books, Leopold's unintentional time travel to the 21st century appears to have caused a disruption of all elevators, on account of his leaving the 19th century before he could register for a patent for his own device. Leopold is intrigued by the cynical and ambitious Kate McKay, Stuart's ex-girlfriend, who comes to the apartment for her Palm Pilot stylus. He observes that she is a "career woman" and that her field, market research, is a fine avocation for a woman, and states that he once dated a librarian from Sussex. Kate dismisses him and demands that he take Stuart's dog for a walk. Leopold is overwhelmed to see that Roebling's bridge is still standing. Back at the apartment, he befriends Charlie, Kate's brother and an actor between gigs, who believes him to be an actor as well, steadfast to his character. Kate and Leopold become romantically involved as they dine and tour New York. Leopold agrees to act in a diet margarine commercial for one of Kate's clients, but walks off the set after finding the product disgusting. He and Kate argue, with Leopold chastising her about integrity, and Kate bristling about his moralising and countering that he lacks connection with reality. Realising that their time together is nearly over, both spend the evening in subdued contemplation. Stuart suddenly returns to his apartment, having escaped from the mental hospital, and sends Leopold back to his own time. Afterwards, Stuart and Charlie notice Kate in the photos Stuart took at Leopold's ball, and realise that her destiny must be to go back and be with Leopold. That night, while Kate is accepting her promotion at a company banquet, he and Charlie race to meet her and show her the pictures. Kate initially rejects their overtures and goes on to give her acceptance speech, but it is there that she sees Stuart's picture and realises that she truly wants to be with Leopold. Kate abruptly ends her speech, and the three of them rush to the Brooklyn Bridge. Kate makes it to the portal before it closes and reappears in 1876, where Leopold appears resigned to his marriage of convenience. Just before Leopold announces his bride, Kate bursts into the building, and he announces her name instead, referring to her as being one the McKays of Massapequa. Among the shocked guests, Kate and Leopold reunite with a kiss and dance a bridal waltz. Thus Kate turns out to be Stuart's great-great-grandmother. The DVD edition contains two versions of the film: one, the original theatrical release, runs for 118 minutes while the director's cut version runs for 122. One scene in the director's cut shows Ryan's character in a test screening for a new film and also features a cameo by Mangold. An additional scene stresses the Duke's ancestry of Stuart, suggesting that Kate may be related to her ex-boyfriend. The soundtrack to Kate & Leopold was released on December 25, 2001. 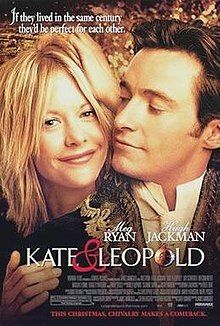 Kate & Leopold received mixed reviews from critics, as the film holds a 50% rating on Rotten Tomatoes based on 126 reviews with the consensus: "Though Hugh Jackman charms, Kate & Leopold is bland and predictable, and the time travel scenario lacks logic." Hugh Jackman was nominated in 2001 for the Golden Globe Award for Best Actor – Motion Picture Musical or Comedy. The film won the Golden Globe Award for Best Song for the song "Until...", written and performed by Sting. The same song was also nominated for the Academy Award for Best Original Song. In the film, Leopold, a 30-year-old member of the British Royal Court, was pulled from his own time, 28 April 1876, to the present day, i.e. circa 2001, when the film was completed. His name, title, and historical persona as Leopold, Duke of Albany is, however, only very loosely and fancifully based on Prince Leopold, Duke of Albany, the eighth child and youngest of the four sons of Queen Victoria and Prince Albert, who was the only real-life Leopold, Duke of Albany. In the film, Leopold is described as being His Grace the 3rd Duke of Albany, which is the style of a British non-royal duke, whereas the historical Leopold, Duke of Albany, was His Royal Highness Prince Leopold George Duncan Albert, a royal duke who was created (1st) Duke of Albany, etc., by his mother in 1881, titles he bore for the remainder of his life which was to last only a few years longer. Leopold died in 1884. In the film, Leopold comments to Kate that he was 'born a duke', so his title is obviously an inherited one (at least in the film version of Leopold). As the film Leopold's father was still alive when Leopold was born, Leopold must have inherited his title from an earlier ancestor (as mentioned in the previous paragraph, the real-life Leopold, Duke of Albany was created a Duke by his mother). The real Prince Leopold belonged to the British Royal Family, which, via Prince Leopold's father, H.R.H. Prince Albert, The Prince Consort, was a branch of the House of Saxe-Coburg and Gotha, the senior line of which, descended from Prince Leopold's eldest brother, Prince Albert Edward, later Edward VII, became the House of Windsor in 1917. Through Prince Leopold's mother, Queen Victoria, the family occupied the British Throne. Queen Victoria was the last British monarch born into the House of Hanover. The movie Leopold gives his full names as Leopold Alexis Elijah Walker Gareth Thomas Mountbatten. This not only diverges from the real Prince Leopold's baptismal and dynastic names, it is also an anachronism of over forty years' duration; for just as the British Royal Family's surname only became Windsor in 1917, so too, in reality, the fantasy Leopold's family name, Mountbatten, is a surname which did not exist in 1876. 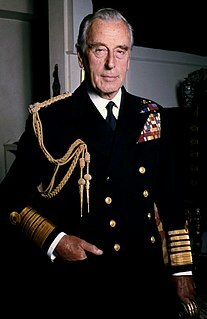 Instead, the surname, Mountbatten, was only adopted on 14 July 1917 by a branch of the non-royal Battenberg family then living in Britain in lieu of the family's original German House or dynastic name of [von] Battenberg. This occurred because of growing anti-German sentiment among the British public during World War I. By that point in the war, the unpopularity of all things German throughout the British Empire was such that both the reigning British Royal House of Saxe-Coburg and Gotha (itself a branch of the German Wettin dynasty), and the quasi-royal, House of Battenberg (a morganatic branch of the Grand Ducal House of Hesse and By Rhine), were thought to be endangered by their close historical family associations with the country of Britain's bitterest foe. They were convinced by their advisors to exchange their German dynastic or House names for English House and Family names (surnames) suggested to them by the College of Arms. By 1917, the British Cabinet and the King's private secretary thought that these name changes would identify their holders more clearly with Britain and her empire rather than their war enemy, thereby making them more palatable to the British public, staving off the danger that they would become the target of the public's ire, and thus safeguarding the survival the British Monarchy in what proved to be tumultuous times for European royalty. Besides these liberties the film takes with dynastic history, there are several other obvious differences between the two Leopolds. The real life Prince Leopold lived from 1853 to 1884, dying when still only thirty, whereas the movie Leopold was rather older, being born no later than 1846, because he was already thirty when his uncle induced him to settle in New York City and look for a rich American bride sometime before April 1876. Opposed to this scenario is the fact that the historical Leopold never went to New York City. Instead, he stayed in Britain where, through arrangements made by his royal mother, he married a German princess, and sired two children, including a posthumous son, through whom he is a great-grandfather of King Carl XVI Gustaf of Sweden, that country's current monarch. While the historical Leopold was a patron of the arts, and noted by Alfred, Lord Tennyson, for his high aims and thoughtful intelligence, he was not an inventor. In the film, however, Leopold has many inventive dreams. Indeed, when he catches Stuart in his rooms, the latter is photographing Leopold's notebooks containing his brilliant ideas. The plot turns on the fact that Leopold must return to the 19th century to patent the elevator, marry, and become Stuart's great-grandfather. Leopold names the elevator company after his valet Otis; however, the real Elisha Otis, who created the "safety elevator" and in 1853 founded the Otis Elevator Company, had quite a different personal history. Leopold and Stuart see each other at John A. Roebling's speech at the Brooklyn Bridge, but the famous engineer actually died in 1869, seven years before their meeting, and the bridge did not actually open until 1883, seven years later. When Leopold awakens to find himself in Stuart's apartment and demands to know where he's being held, he tells Stuart "As far as I'm concerned, you might be Jack the Ripper!" These Whitechapel murders to which Leopold refers, however, took place between 1888 and 1891, and so, much too late for Leopold to know of them. He says "I can only assume I'm in a nightmare brought on by agita, or else I am dead." But the word agita ("heartburn") came into use in 1980–85. Leopold mentions having seen the premiere of The Pirates of Penzance "last month" (March 1876), though Penzance actually had its world premiere in New York City on 31 December 1879. When Kate's boss, J. J. Camden, is trying to impress Kate with his knowledge about the opera La Bohème (by Giacomo Puccini), and Leopold corrects Camden's mistakes about the opera (concerning the name of the male lead and the language in which the opera is sung), this is an impossibility as the Puccini opera had its world premiere on 1 February 1896 in Turin, Italy, twenty years after Leopold's travel to the future. The opera has its origin in a novel published by Henry Murger in 1851. This means that while Leopold can know about the novel, he must remain ignorant of the opera, since it has not yet been composed. In the Italian version of the movie, the opera La Traviata is used instead in this dialogue. As La Traviata premiered in 1853, this gets round this anachronism, making the story plausible to the Italian public. ^ "Kate and Leopold - Box Office Data". The Numbers. Retrieved 7 August 2011. ^ "Kate & Leopold 2001 Soundtrack — TheOST.com all movie soundtracks". Theost.com. Retrieved 21 August 2017. ^ "Kate & Leopold". IMDb.com. Retrieved 21 August 2017. The House of Hesse is a European dynasty, directly descended from the House of Brabant. It ruled the region of Hesse, with one branch as prince-electors until 1866, and another branch as grand dukes until 1918. Julia, Princess of Battenberg was the wife of Prince Alexander of Hesse and by Rhine, the third son of Louis II, Grand Duke of Hesse. The daughter of a Polish general of German descent, she was not of princely origin. She became a lady-in-waiting to Marie of Hesse, wife of the future Tsar Alexander II and a sister of Prince Alexander of Hesse and by Rhine, whom she married, having met him in the course of her duties. The marriage of social unequals was deemed morganatic, but the Duke of Hesse gave her own title of nobility as Princess of Battenberg. She was the mother of Alexander, Prince of Bulgaria, and is an ancestor of Charles, Prince of Wales, heir to the British throne, and to the current generations of the Spanish royal family. 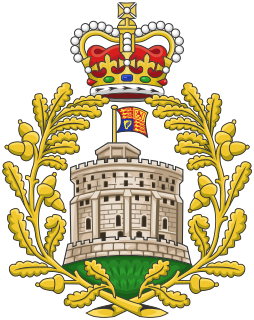 The Mountbatten family is a European dynasty originating as a cadet branch of the German princely Battenberg family. The name was adopted during World War I by family members residing in the United Kingdom due to rising anti-German sentiment amongst the British public. The name is a direct Anglicisation of the German Battenberg, a small town in Hesse. The title of count of Battenberg, later prince of Battenberg, was granted to a morganatic branch of the House of Hesse-Darmstadt, itself a cadet branch of the House of Hesse, in the mid 19th century. The Battenberg family was formally a morganatic branch of the House of Hesse-Darmstadt, rulers of the Grand Duchy of Hesse in Germany. The first member was Julia Hauke, whose brother-in-law Grand Duke Louis III of Hesse created her Countess of Battenberg with the style Illustrious Highness in 1851, at her morganatic marriage to Grand Duke Louis' brother Prince Alexander of Hesse and by Rhine, and elevated her title to Princess of Battenberg with the style Serene Highness (HSH) in 1858. The name Battenberg was last used by her youngest son, Prince Francis Joseph of Battenberg, who died childless in 1924. Most members of the family, residing in the United Kingdom, had renounced their German titles in 1917, due to rising anti-German sentiment among the British public during World War I, and changed their name to Mountbatten, an anglicised version of Battenberg. The name Battenberg refers to the town of Battenberg in Hesse. Alexander Mountbatten, 1st Marquess of Carisbrooke, was a British Royal Navy officer, a member of the Hessian princely Battenberg family and a grandson of Queen Victoria. Prince Alexander Ludwig Georg Friedrich Emil of Hesse, GCB was the third son and fourth child of Louis II, Grand Duke of Hesse and Wilhelmina of Baden. He was a brother of Tsarina Maria Alexandrovna, wife of Tsar Alexander II. The Battenberg / Mountbatten family descends from Alexander and his wife Countess Julia von Hauke, a former lady-in-waiting to his sister. 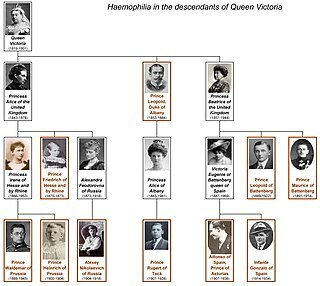 Haemophilia figured prominently in the history of European royalty in the 19th and 20th centuries. Britain's Queen Victoria, through two of her five daughters, Princess Alice and Princess Beatrice, passed the mutation to various royal houses across the continent, including the royal families of Spain, Germany and Russia. Victoria's son Prince Leopold, Duke of Albany also suffered from the disease. For this reason, haemophilia was once popularly called "the royal disease". Tests on the remains of the Romanov imperial family show that the specific form of haemophilia passed down by Queen Victoria was probably the relatively rare Haemophilia B.
Lord Leopold Mountbatten, GCVO was a British Army officer and a descendant of the Hessian princely Battenberg family and the British Royal Family. A grandson of Queen Victoria, he was known as Prince Leopold of Battenberg from his birth until 1917, when the British Royal Family relinquished their German titles during World War I, and the Battenberg family changed their name to Mountbatten. 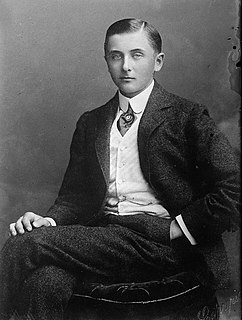 Prince Maurice of Battenberg, KCVO, was a member of the Hessian princely Battenberg family and the extended British Royal Family, the youngest grandchild of Queen Victoria. 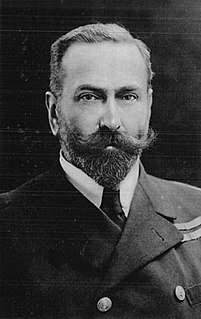 He was known as Prince Maurice of Battenberg throughout his life, since he died before the British Royal Family relinquished their German titles during World War I and the Battenbergs changed their name to Mountbatten. St Mildred's Church, Whippingham is the Church of England parish church of the village of Whippingham, Isle of Wight. Princess Anna of Montenegro was the seventh child and sixth daughter of Nicholas I of Montenegro and his wife Milena Vukotić.